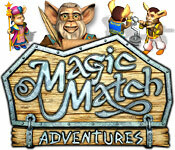 Magic Match Adventures is rated 3.8 out of 5 by 9. Rated 5 out of 5 by catbag8717 from Just as Much Fun As The First One! I absolutely loved this game!! It's just as good as Magic Match. Good Parts: Gameplay is much improved. As well as having to match the tiles, any match of 5 or more can up to quadruple the components score. The graphics are much better. You don't really notice it in the map, but once you get to the Magic Realm it's very noticable. The levels are a great challenge Potions are of great help such as Fireball potions to thaw all the frozen tiles. The game actually had a storyline, which was good. You need to make potions to thwart an evil spirit which is placing the kingdom in danger. OK Parts: While the timer didn't bother me as much as I thought it would, I still wish it hadn't been there. I like to play at my own pace. Bad Parts: Almost everything from the original has been altered, including the removal of Duel mode. I was really disappointed by this, because Duel mode was the best mode of play. Gameplay was a little repetitive due to only one mode. Even though it's not as good as the first, Magic Match Adventures should still provide a great time for lovers of the series or new players. It's great fun and I'll definitely recommend it. Rated 5 out of 5 by Kodicat from Such a cute; yet challenging Match 3 Game The first reviewer gave such an excellent and accurate description of the game, there's not much I can add to it as far as details of playing. There is a lot to do in each level, and it is timed so that does make the game more challenging, but didn't find it to be too frustrating....even though I did have to replay some levels to get through them. I just finished the game last night, and found it to be so much fun to play that I enjoyed the challenge and it made it more exciting to finish the more difficult levels. Cute graphics, characters and story line; one of my favorite Match 3 games, and will play it again. Rated 5 out of 5 by kiesha_shafi from Love this game,very interesting Love the graphics and the puzzles. 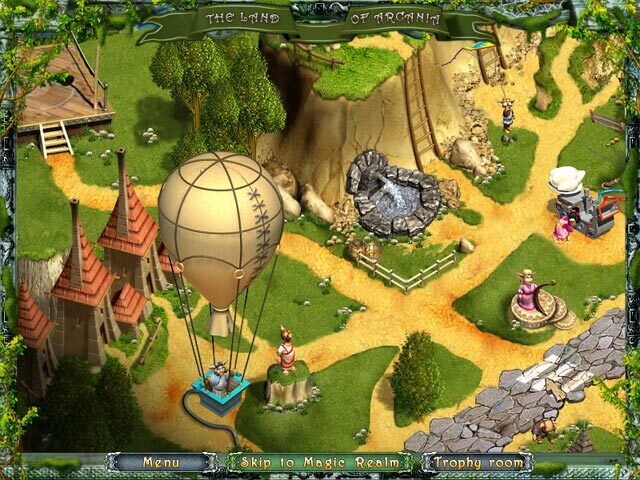 Rated 4 out of 5 by sereneorchid from Lots to like in this fantasy game except the timer There's lots to love in this match 3 game: great animations, beautiful graphics, a fantasy storyline, and entertaining special effects. Even the matching icons are nicely done, which strangely isn't always true of matching games. And at the time I tried the game, it was even on sale. The only thing holding me back was the timer. 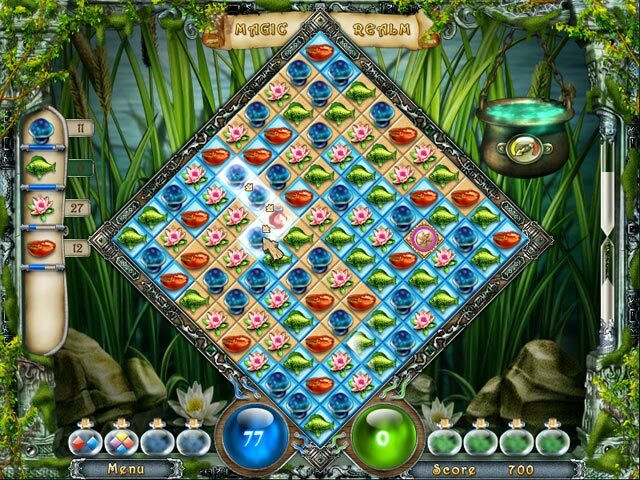 During the matching part of the game, not only do you have to make the usual matches while breaking frozen and boarded-up tiles, but each level requires you to collect a certain number of each icon in order to create your potions. While you're making matches, you also need to collect green and blue tiles underneath the icons to power up your spells. There's a lot going on and a lot to do. And there's nothing wrong with that...except for the timer. You'll have to see for yourself whether the timer is reasonable for you. It seemed a little short to me for everything that you need to accomplish in a level. I played the one-hour trial and only had to repeat a level a couple of times, but I play games to relax, not to get tight neck muscles. If the game had offered a relaxed mode with no timer, I would have quickly bought it. Rated 3 out of 5 by thimbles from The Timer got me too! A cute matching game, if there were a non-timed mode. Graphics were a little cutsie. Story intruded on game play. I thought there were too many things going on way too early in the game: red potions, blue and green magic, frozen tiles right away, and the timer! I don't like timers anyway, but usually don't have a problem in the early parts of Match 3. I agree with the first reviewer: I play games to relax, not to be stressed. I have the original Magic Match and like it when I want to be challenged, but it seems somehow simpler than this one. Rated 3 out of 5 by myyorkies1994 from Take the Trail First Senereorchid noted many of the right points. As an Expert M3 player, I have to agree that the timer is too short. The music changes to fast beating jungle drums when the timer is getting low, so I found it easier to run the game with the sound turned off. 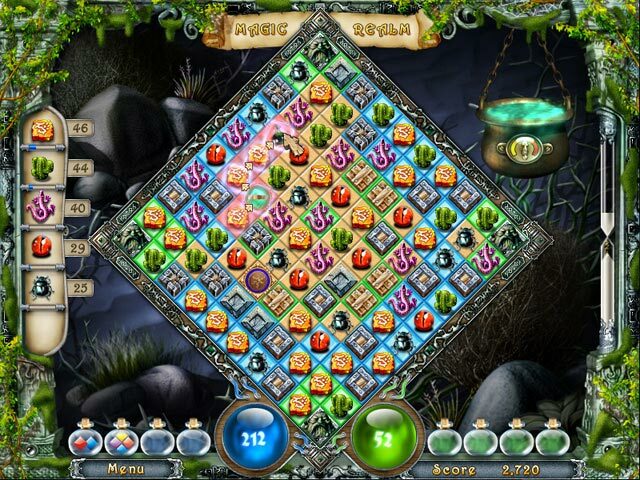 The concept of collecting a specific number of icons is common in M3 and provides motive; however, this game has too many icons going on at the same time, so you continually run out of available matches and have to use potion to shuffle the board. That's not good - it wastes time. Hint: unfreeze the frozen panes ASAP to gain more available working tiles. This game is cute and with some revisions would be worthy of purchase, but not in its current form. Rated 2 out of 5 by Roxianna1952 from Too Frustrating The timer runs out much too quickly. So it takes several attempts to get through one match. The computer can cast a spell to increase the number of tokens you need to collect without limit but you can only block it a limited number of times (depending on your health). It costs 200 points to block it once. For example, in the final battle, you only get 200 points. So you end up with 50, 60, 70 tokens to collect while the computer has 8. After spending three hours trying to beat the last battle, I exited and uninstalled the game. Not worth the time, money or storage space. As another reviewer said, "I play games to relax, not be frustrated." Rated 2 out of 5 by Heavenlyrabbit from Lots of Potential, Falls Short There is some potential for a good game here but this falls very far short. The graphics are cheap looking and comprised of an unappealing mix of cultures. Imps that look sort of like monkeys in Native American dress with a dash of a few other cultures thrown in. Stiff looking animations. I tried to overlook the poor job done on the artwork but then there's the gameplay. Timed rounds that are far too short for all that must be accomplished. Kept on getting "No Available Matches" and having to use Reshuffle. Went quite far in trial but when I finally got a round where I ran out of time I couldn't have cared a less. The attempt at a storyline was a valiant effort but nothing could save this mess. I wouldn't want this if it were free.